Just got an email this morning from Honor the Earth with a link to a new website titled: Stop the Line 3 Pipeline. Enbridge Line 3 is Minnesota’s version of the Dakota Access Pipeline (DAPL). The pipeline will pose risks to Minnesota’s waters and wild rice areas and ignore and violate Anishinaabeg treaty rights. Enbridge, an energy transportation company, has pipelines that carry dirty Canadian tar sands crude oil from Alberta, Canada to various sites in the United States. It is proposing an expansion of Line 3 through Minnesota, 337 miles of pipeline that run from our state’s northwestern border to Superior, Wisc. Its proposal would increase Line 3’s carrying capacity. It would reroute a significant part of the line, taking it through the Mississippi River headwaters region. It would abandon a significant stretch of the old Line 3 and just let it deteriorate in the ground. Those are bad ideas for the state. In a related matter, Enbridge is suing Minnesota counties to reduce the property taxes it pays for its pipeline right of ways. It could mean a hit of tens of millions of dollars to our state budget. Line 3 is a disaster waiting to happen. This Enbridge oil pipeline was built in 1961 and despite having hundreds of thousands of structural anomalies, Line 3 continues to ship crude oil from Alberta to Superior, Wisconsin. This aging pipe [has] ten times as many corrosion anomalies per mile than any other Enbridge pipeline in the same corridor. Enbridge wants to abandon this legacy of contamination in the ground, walk away, and build an entirely new corridor, through the heart of Minnesota’s best lakes and wild rice beds, and through Anishinaabeg treaty territories. People are probably more familiar with DAPL than with Line 3, but there are strong similarities. For instance, both involve treaty violations. 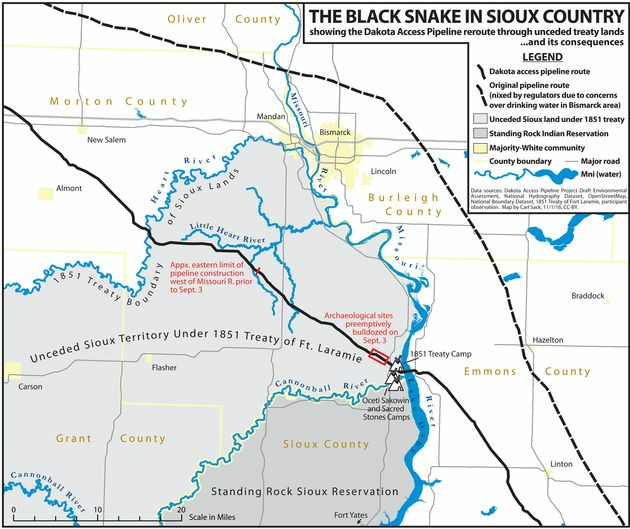 In DAPL’s case, Indian nations argue that they continue to have rights based on the 1851 Treaty of Fort Laramie, rights to use lands outside reservation boundaries. Here is a map showing the “unceded territory.” This issue is still being litigated as part of the DAPL court challenge. Similarly, Enbridge Line 3 crosses territory in northern Minnesota where the Anishinaabeg retain hunting, fishing, and gathering rights. At this point, the Anishinaabeg nations have no more voice in the process than ordinary citizens. The Treaty of 1837 did not include northern Minnesota but did set an important precedent for later treaties. The 1999 the U.S. Supreme Court decision Minnesota vs. Mille Lacs Band of Chippewa Indians ruled that the Anishinaabeg retained the same hunting and gathering rights in the lands they ceded in northern Minnesota as they had in the 1837 Treaty. So by treaty, the Anishinaabeg have a legitimate stake in Line 3 decisions and their opposition needs to be taken seriously. Enbridge’s Line 3 proposal will get more public visibility soon. The state will release its draft Environmental Impact Statement April 3, triggering a public comment period. The decision to approve or reject the pipeline rests with the Minnesota Public Utilities Commission. Yet as this public process unfolds, Enbridge is suing Minnesota counties for what it says are excessive property taxes. The Star Tribune ran a story today headlined: Enbridge tax challenge could cost northern Minn. counties millions. Enbridge Energy’s massive property tax challenge may end up costing several northern Minnesota counties millions of dollars. In fact, two counties — Clearwater and Red Lake — could end up refunding more money to Enbridge than they raise annually from all of their property tax payers. Enbridge is disputing the value of its pipeline system in Minnesota. The Minnesota Department of Revenue puts it at $7.1 billion, Enbridge says it’s more like $4.3 billion. If Enbridge wins the suit, the costs could be in the tens of millions of dollars for back taxes, the article said. But those costs will likely fall on the state as a whole rather than a few counties. State legislators already have introduced bills to use state money to cover tax appeals on property where the Revenue Department did the valuations.